Tracker Software Products :: Knowledge Base :: manage licenses for PDF-XChange Products on a Windows Terminal Server? How do I manage licenses for PDF-XChange Products on a Windows Terminal Server? I want to deploy both free and licensed versions of PDF-XChange products on a Windows Terminal Server. How do I specify only certain users to have access to the full version? If a license for any PDF-XChange product is applied during install it will be available for all users. Licensing on Terminal Server with PDF-XChange is essentially handled by either running the installation with the serial key or without. For per user licensing install the Software with no license and apply the key in each user's session. When you install PDF-XChange, if you include the serial Key in the installation, then all users of your Terminal Server will have access to the full Licensed features of the software. You can then, through Group Policy and/or NTFS permissions, restrict the program only to those users you choose. Advantages: All users have full access to all the features of the the software and no license keys need be installed by individual users. Disadvantages: Requires detailed management of user permissions. All users who are to have full access to all the features of the the software, must have rights and permissions to access the software set explicitly. Typically this is done through a Group Policy. All other users must be explicitly restricted access to the software. Please note that we do not have a concurrent user license model, so all users who have access to the full software need to have a valid PDF-XChange License. Installed this way all you users that can log into an RDS session will have access to the fully licensed Editor. 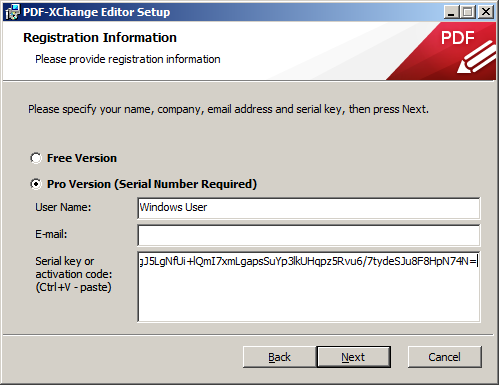 When you install PDF-XChange, if you do not include the serial Key in the installation, then all users of your RDS Server will only have access to the free features of the Software (note that PDF-Tools and PDF-Xchange Standard do not offer any free features, and will place demo watermarks without notice). If these users attempt to use licensed features of the Editor, a watermark will be placed on the document; The users are clearly warned before this happens and given the opportunity to cancel the operation that will add a water mark. In this scenario you might want to consider hiding the restricted licensed features. On a per user basis see this: https://www.tracker-software.com/knowledgebase/229 and to set it for all users at install time. Also see below at "Additional Tasks"
You can then pass the serial key to those users whom you wish to have Premium features and when they enter that serial in the Editor manually (they simply double click the xcvault file), it will be stored in the Windows Registry under CURRENT_USER so only those users will have access to the full product. Again it is your responsibility to ensure you have enough licenses to cover all those users. Advantages: All users have access to only the free features of the the software and individual users can be given the key to unlock only their own profile to use the full Pro feature set. No permissions need be set up to manage access to the software. Disadvantages: Requires any user who is to use the full featured version of the software to manually enter a serial key. Make PDF-XChange the default for all users. Hide Restricted Licensed functions in the Free Viewer version. Note that this option only affects the PDF-Xchange Editor, any other products, such as PDF-Tools, and either of our Printer drivers can and will still place watermarks without warning if used without a valid license. KB#447: Determine what version I should install/how can I retrieve my serial key? KB#286: How do Imanage licenses for PDF-XChange Products on a Windows Terminal Server? KB#282: Why won't the "Send by E-mail" feature work in conjunction with Microsoft Outlook? KB#338: What are the MSI installation switch options for the PDF-XChange family of products?